Even if the weather outside is a little frightful, that’s no reason to neglect your nails! With a steady hand, the right tools, and a little patience, you can create these beautiful nail designs at home. If you’re not feeling confident in your nail art skills, why not make a salon appointment for a manicure at the Health and Style Institute’s beauty school in North Carolina? 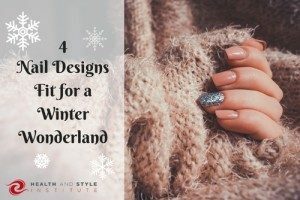 Give yourself a cold weather pick-me-up with these fun and creative nail designs that are fit for a winter wonderland. Winter is a great time to top your nails in subtle, muted hues. A rosy, pink mauve like OPI’s Just Lanai-ing Around will pair beautifully with a silver or gold glitter accent nail. If you’re feeling extra fancy, add a simple snowflake design to one of the pink nails with a brush, dotting tool, or stamper for a simple but elegant manicure. Do you remember how much fun it was to shake a snow globe as a kid and watch the snow and glitter settle? This wintery manicure recreates that magic — all you need is a good, clear topcoat, a clear-base glitter polish (like OPI’s Chasing Rainbows), black nail polish, and a brush or dotting tool. Paint a thin stripe of black polish across the tips of each nail. You can also draw or stamp on fun designs, like snowflakes, to create your snow globe effect. Once that polish has dried, sweep over your whole nail with the glitter polish, which is what creates the “snow.” Finish with a clear top coat and rock your snow globe style. You’ll light up the night with this funky manicure. Paint your nails with black polish to set your base. Then, dip a damp cosmetic sponge into shimmery gold nail polish and gently press onto your nails to create the ombre effect. Now your nails are dressed to impress! Create this beautiful mani with glitter polish, silver polish, a cosmetic sponge, snowflake stampers, and three of your favorite shades of blue polish. Paint your nails the lightest shade of blue to set the stage for your gradient. Then, paint all three blue polishes onto a piece of paper before dipping a damp makeup sponge into the polish. Gently press the sponge onto your nails, and don’t be surprised if there’s cleanup to do after! Once it’s dry, apply a coat of glitter polish and stamp on your silver snowflakes. Be sure to seal in your hard work with a fast-drying topcoat! Try out these designs yourself to create a manicure fit for a winter wonderland. If you want to take your love of nail art to the next level, call 336-885-3452 to talk to an admissions advisor at Health and Style Institute to see if beauty school is the right fit for you!